Note: This article was originally published in Technician on September 14, 2006. Steve Hurlburt once was the publisher and editor of a magazine in Atlanta, Ga. Now, he's traveling around the country promoting his first venture into the world of film, Dreadheads: Portrait of a Subculture. It's a change inspired by, of all things, the Grateful Dead. "I enjoyed Grateful Dead music and going to the shows, and I noticed these kids that seemed to always hang out with each other," Hurlburt said. "There seemed to be some kind of aura around them and their closed community. They weren't black or gay, there wasn't anything inherent that might set them apart. They were choosing to be a minority of society." Fascinated by these "dreaddie kids", Hurlburt decided to investigate the matter by filming a documentary. 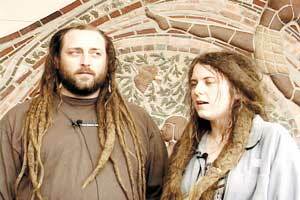 The result is Dreadheads, which the 53-year-old filmmaker will present at the Campus Cinema on Friday night. Hurlburt was one of only three people who handled the filmmaking. Dreadheads was co-directed by Flournoy Holmes, who had experience filming music videos. Flournoy's son Fletcher also helped with filming and editing. The directing duo seemed a natural match due to their complementary skills. "I come from a writing background, and Flournoy comes from an art background," Hurlburt said. Armed with two miniDV camcorders, the group set off on a cross-country tour that took them everywhere, from Phish's "It Festival" in Maine to San Francisco. "We started filming in May 2002 and filmed off and on until summer of 2004," Hurlburt said. "We literally went coast to coast. Most of our filming was done at concerts for Phil Lesh And Friends and The Dead." Unfortunately, as could be expected, Hurlburt and his crew often encountered problems, not the least of which was technical difficulties. Fletcher Holmes, who edited the film, also worked as a camera operator and brought along an old Super-8mm camera that was less than reliable. "The Super-8 camera was actually breaking while we were filming. It was really old. In fact, some of the cool effects in the movie, particularly in regards to lighting, were due to that," Holmes said. Furthermore, the film features interviews with several noteworthy musicians, authors and professors. Among them are Bob Weir of The Grateful Dead, John Bell of Widespread Panic and David Gans (author, "Playing in the Band"). However, not everyone was eager to get involved. "The biggest challenge was getting people to see that there was a story here that was relevant and cool and worthy of a movie," Hurlburt said. "A lot of times people weren't sure if they could participate just because they didn't know if they had anything relevant to say. But once they thought about it, they found they did." Perhaps the most dangerous obstacle came in the form of the Dreadheads themselves. In a subculture in which it's not uncommon to find drugs such as marijuana, filming wasn't always appreciated. "The people 'living on the edge' didn't particularly want to be photographed," he said. "There were a couple of situations that got pretty intense." Problems aside, Hurlburt and his crew managed to get through them. He is now once again on tour, this time screening Dreadheads at college campuses and independent theaters across the country in an attempt to give the rest of the country a glimpse at this group of people who first captured his interest more than four years ago. "I wanted it to be an authentic rendering of this subculture," Hurlburt said. "We wanted to make an interesting, fun look at this slice of life."